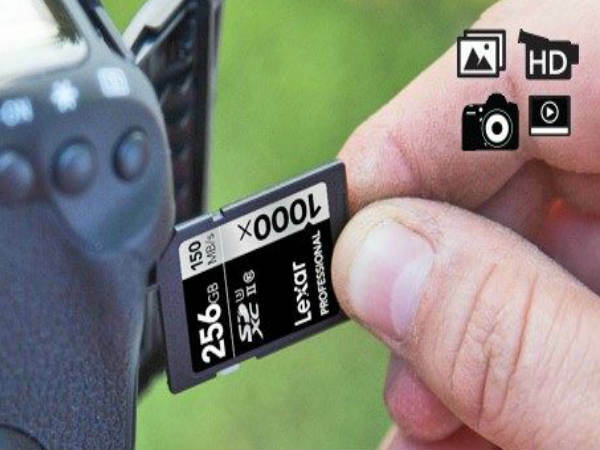 Lexar, on Monday unveiled it's 256GB MicroSD card which will be part of its Professional 1000x line. While the company previously offered same capacity in their slower High-Performance 633x line, the new card is built to cater to requirements of 4K video recording. The new MicroSD card boasts a maximum transfer rate of 150MBps along with a maximum write speed of 90MBps. The 256GB 1000x card is still built on the UHS-II bus interface and meets U3 speed class requirements. Which simply means it offers sustained write performance of at least 30MBps, suitable for a wide variety of high-end video applications. One of the highlights is that, the card sports a "Works with GoPro" label, ensuring it will operate flawlessly in cameras like the GoPro Hero5. Finding the balance between high capacity and fast performance makes this 256GB card more dearer, with an expected retail price of $350 approximately Rs. 24,000/-, which is well above any other Lexar MicroSD card. This may be one of the reasons the company isn't producing similar capacity cards in its fastest 1800x series, as costs may simply be sky rocket and have few or no takers. Users will be pleased to know that Lexar delivers additional value through a small USB 3.0 card reader which is included in the box, which will leverage the card's 150MBps transfer speed. Furthermore, customers are given lifetime access to Image Rescue software to retrive files after accidental deleting or formatting. The icing on the cake being the card also brings with it a limited lifetime warranty, the card should be available towards end of the first quarter of 2017.